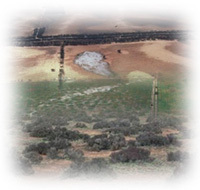 The Mallee region consists of a vast plain where there are superficial undulations. Elevations vary in the south of the region from 100 to 120 metres above sea level, falling to between 50 to 70 metres in the centre and north. The major drainage pattern is the Murray River system along the northern boundary. There are occasional creeks such as the Tyrell, Lambert, Yarriambiack and Outlet Creeks that are usually dry. They terminate in the central part of the region in basins containing salt and gypsum. Four main landforms have been recognised in the region: dunes, jumbled dunes, ridges and hummocks. Other landforms such as lunettes and copi islands occur to a more limited extent. These superficial undulations are all of aeolian origin. Source: Rowan and Downes (1963).